New York City Writing Project – Winter Writing Marathon at MCNY! Winter Writing Marathon at MCNY! 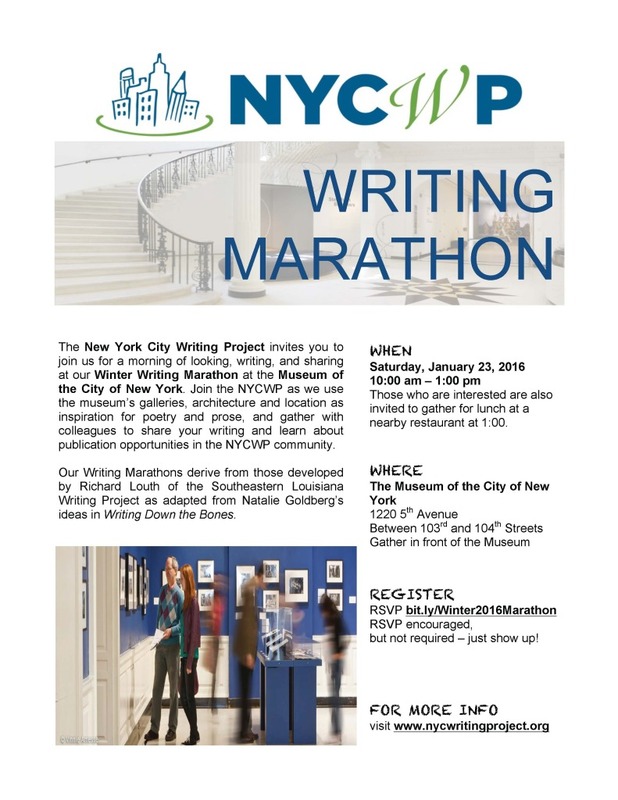 The NYCWP will host our winter 2016 Writing Marathon at the Museum of the City of New York on Saturday, January 23rd, 2016, from 10:00 am – 1:00 pm. Those who would like to join us for lunch at a nearby restaurant after the marathon are welcome to do so! Please RSVP if you would like to attend the Marathon by visiting bit.ly/Winter2016Marathon. RSVPs are encouraged, but not required. All NYCWP Writing Marathons are free. Museum suggested admission is $14, but waived for teachers with appropriate identification. More information about the museum and admission can be found at www.mcny.org. next → #T2T16 Keynote Speakers Announcement!